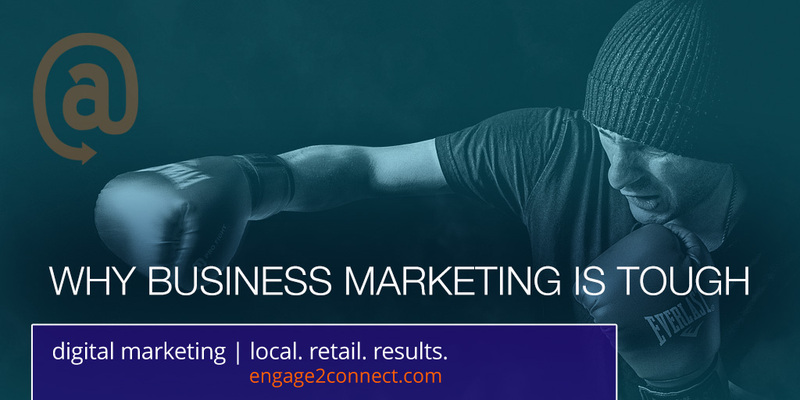 One thing our local small business clients tell us frequently is that doing their own digital marketing is difficult. If you are a small business reading this post, we are pretty confident that you agree with this struggle and it’s no surprise. In fact, a study done recently shows that a significant number of small business owners are still attempting to handle their digital marketing efforts on their own, in spite of the numerous other requirements resting on their shoulders. According to the recently released LeadPages / Infusionsoft study reports that 47% of small business owners do their own marketing program. With nearly half of small businesses doing their own marketing, there is certainly a lot that can be learned from their efforts. The 14 page study report from the joint research provides some takeaways that detail just how significant the small business marketing struggle really is. Why Is Small Business Marketing Hard? Why is small business marketing hard? While pouring over the detailed research on small business marketing, there was some detailed information that caught our attention. Much of the study results brought to light several interesting data points that also provide insight into why small business marketing is difficult as well as some of the biggest challenges small business marketing presents to entrepreneurs. Let’s cover some of these key areas and we will also provide some of our own experience and insight within each. As we discussed above, doing your digital marketing on your own can not only be lonely, it can also be overwhelming. With the multiple channels most businesses need to be effective with online constantly going through various states of change, coupled with the increasing sophistication, quantity and quality requirements which are scaling rapidly, most small business owners are struggling to see marketing results. When you also understand the need for a real strategy to make it all work and today’s requirement that you are continually creating your own blog, graphic and video content, you begin to get the picture. Digital marketing for small business is harder than many think. Now we can certainly understand that so many small business owners don’t really know if their marketing is actually getting results, given the fact that there are so many variables. With all of the required social networks, search, rating sites and other platforms that require constant attention online, and then you add to that the sophisticated analytics and tracking applications needed to measure effectiveness, it all gets pretty complicated. Small business owners really have to look at their marketing similar to their profit margins on the products and services they sell. In other words, you wouldn’t continue to sell a product that you don’t make a profit on, nor would you sell it without knowing what your profit margin is. The same goes for small business marketing. If it can be measured, it should be tracked! If you’re a small business today, your digital marketing has to combine attraction marketing that brings in new customers, as well as customer management marketing that brings them back again. Managing leads and customer relationships over the short and long term has to have a priority within your small business marketing efforts. First of all, let’s define what a marketing stack is. A digital marketing stack would be the various software, tools and applications that are used to conduct your integrated digital marketing online. Secondly, you need to hear what we are about to share with you. We use between 12 and 18 software tools and applications to manage our client small business digital marketing programs weekly. The variance depends on the client, their marketing and the platforms and strategies required for their specific niche. At the most minimum level, we use about 12 applications for our clients. No wonder small business digital marketing is hard, right? It shouldn’t be a shock to anyone that small business marketing is difficult. Digital marketing represents an ever changing compilation of platforms, strategies, rules and applications that take years to master, only to require relearning again. We literally spend hours each and every week just reading and studying in order to keep up with the changes that social platforms, software applications, search and other components make every single week that impact what we do for our clients. This is challenging enough for a small digital marketing agency to keep up with, let alone a small business owner that is managing their company, its infrastructure, staff and specific market niche. In the end, small business marketing is challenging because it involves considerable knowledge and experience across several different disciplines, and those disciplines change every single week. Knowledge, experience and the expertise to make small business marketing truly effective costs far less than spending your time trying to execute it effectively without those requirements. How can we help?